How many times does this play out? You come home, ready to sit down in your favorite chair, and find a big spot right in the middle. You go to the cleaning cabinet and pull out some spray foam cleaner, a brush, and go to work on the spot. Only to discover days later, it has reappeared …and it has grown! Eventually you decide to either cover the chair or replace it. What are your options? Newly Restored specializes in cleaning upholstery – like your chair! Stains – even those you don’t see – carry bacteria. If left unchecked, it can potentially affect the health of everyone in the home. 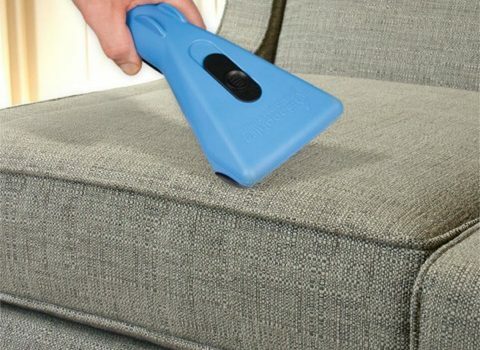 Our patented tools, and specially formulated cleaners will remove those stubborn stains, kill the germs and bacteria, and restore the chair to like new condition. On top of that, we can apply a stain guard to protect it from any spots coming back. Don’t be fooled by store-brand upholstery cleaning products such as upholstery shampoos, sofa cleaners, steamers, and other on-the-shelf products at your local stores. This may be a short term solution, but the stain will eventually come back and the bacteria will remain embedded within your furniture or cars. A professional cleaner has the industrial equipment to remove the stain for good and kill the bacteria. Call us today for a free quote!